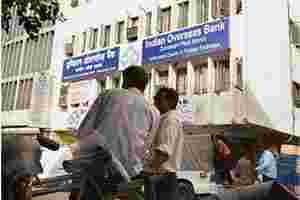 Tech power: An Indian Overseas Bank branch in New Delhi. The bank plans to hive off its IT division as an independent subsidiary. Chennai: Even as most of India’s public sector banks are buying so-called core banking solution (CBS), or software to run their operations, from firms such as Infosys Technologies Ltd, Tata Consultancy Services Ltd (TCS) and i-flex Solutions, Chennai-based public sector bank Indian Overseas Bank (IOB) plans to sell its internally developed CBS to smaller banks in the country. To this end, IOB plans to hive off its IT (information technology) division as an independent subsidiary. This move, according to the bank, will help monetize the company’s IT capabilities and generate additional revenues. IOB claimed that this is the first time a bank is looking to hive off its IT division. “The hiving off would be for unlocking the value," said S.A. Bhat, chairman and managing director, IOB. “The exact timeline for hiving off, however, has not yet been decided." IOB proposes to sell its CBS to cooperative and rural banks and is confident that it will be a better option for them in terms of cost than software from other companies. Standard Chartered Bank Plc. uses its own banking software—created by its Indian subsidiary—across 50 countries, and Shamrao Vittal Bank, a Mumbai-headquartered cooperative bank, has a banking solution that it sells to other cooperative banks. Citibank had an internal software division, Citi Corp. Overseas Software Ltd, that it hived off as Citicorp Information Technology Industries Ltd; it eventually became i-flex, which is now 80.6% owned by Oracle Corp. The bank said the cost of developing its own CBS was limited to the salaries of the IT employees and hardware. It did not elaborate on the cost. It also did not give details of how its software would be priced or the pricing mechanism (licences, modules and the like) it would follow. Indian Bank, which signed a deal with TCS in 2004, spent more than Rs100 crore for a CBS used across 1,340 branches. IOB’s low-cost CBS will help small banks, said an expert. “This will certainly help smaller banks as the nature of the CBS developed by IOB would be more in tune with the requirements of the (local) banking industry. It might be cheaper also for smaller banks," said Chandana Jha, analyst, banking and financial services, PINC Research. The bank’s IT division employs 150 people, of which 25 are into software development, and the rest are involved in deployment and maintenance. The bank has implemented the CBS in 900 of its 1,900 branches and hopes to cover the rest soon; it hasn’t set a deadline for this. IOB started developing CBS in the beginning of 2004 and started implementing it from January 2005. The bank also developed its own software for computerizing and automating its branches. Its total spend on IT was Rs147 crore in 2006-07. This includes hardware, peripherals, network equipment, automatic teller machines and software for administrative purposes. The bank ended 2006-07 with Rs1.64 trillion in business income and Rs1,008 crore in net profits. On Thursday, shares of IOB closed at Rs164 each, down 2.84%, on the Bombay Stock Exchange (BSE).